The Natural-Historical Landscape of Izeh is part of the Tentative list of Iran in order to qualify for inclusion in the World Heritage List. I camped at this site - even in winter it was nice and cold and the morning sun greeted me along with a few dozen sheep bleating. The local community of shepherds surely didn't mind. I thought I would spend a long time looking at the site in the morning but actually it is just a few rock carvings. In retrospective I would have taken a torch to look at them in the dark and continue driving to a hotel. There are only a carvings, five in total I think although I only found 4. Most of them are unimpressive, the one with the king and queen are kind of impressive but what I think this site comes down to is that the local government thinks this is important and hasn't seen enough rock carvings around the world. I'm saying this with little info on the site of course. It appears to be the best example of early-Elamite period rock carvings - as special this may be. The site is free to access with some boardwalks making this easy enough. It is a decent stop between Shushtar and Esfahan, a new road buying built between Izeh and the former and thus it is getting more convenient to drive through the mountain areas. 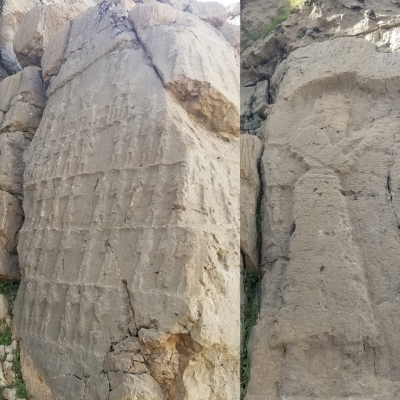 I live in IZEH .stone heritage in this region is under mismanagement and destructin.I can send some pictures if you want.